Stuart has been in practice at the Bar in Newcastle for over 10 years, having been offered pupillage in 2005 and then called in 2006. 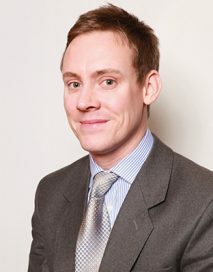 In that time he has developed a strong family law practice – that includes frequent multiple day public law and care work representing Local Authorities, Children’s Guardians and family members – which comprises the vast majority of his work, although he maintains small criminal and civil law practices. He has a considered and measured manner in conference, negotiation and Court which frequently proves very popular with clients, especially within sensitive Family Law Proceedings. He has experience undertaking high profile work representing high profile clients, including conduct of Crown Court matters for an extremely well-known Premier League footballer, as well as securing 2 of only 8 ‘post 3am’ drinking licences in the whole of the North of England for a high profile leisure company. The vast majority of Stuart’s practice comprises Public and Private Family Law work. He has a wide range of public law experience in both the county court and the family proceedings court. This includes care work in multiple-day contested matters for the Local Authority and Guardian, as well as parents, interveners and other family members. He also has a wide experience in private law, many involving lengthy contested hearings in contact and residence matters, Re: L hearings, as well as contested applications for injunctions (non-molestation/occupation orders and specific issue injunctions (including change of name)) as well as applications for committal. He also has experience drafting for and conducting various appeal hearings in higher Courts on such matters. Stuart has a wide experience of Civil Law hearings – particularly small claims and fast track hearings including credit hire matters – having undertaken many hearings for both claimant and defendant parties. He is familiar with the specific case law from the high courts regarding impecuniosity, spot hire rates and consumer credit arguments. He also has wide experience of Road Traffic Accident cases and claims for non payment by small businesses at both small claim and fast track hearings. Stuart has also had conduct of various fast track cases, inquests, infant approvals, bankruptcy hearings and bank charges matters, as well as drafting opinions on a range of civil law matters, including insolvency and personal injury issues. He has also enjoyed success in his burgeoning licensing practice, securing 2 of only 8 existing ‘post 3am’ drinking licences for establishments in the whole of the North of England as well as representing other local establishments in liaising with local authorities.